Are you an EASY? MEDIUM? HARD? or EXPERT? 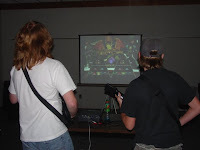 Our first ever Guitar Hero III tournament at Morton Public Library was a success! Participants battled each other for over an hour -- marking their score each time. After all gamers had three opportunities to battle, the teens with top scores battled off for first and second place. Top honors went to Levi Crotwell (pictured in black t-shirt). 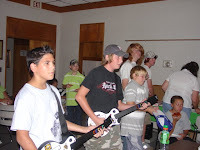 This tournament was for 5th through 8th grade. We invited Levi to come back to compete this week when we hold a Guitar Hero III tournament for 9th grade through adult participants. Join us this Thursday at 6:30 p.m. Call 601.732.6288 for details.